By Cheryl Mathieu, Ph.D., M.S.W. Caregivers often neglect their own health while caring for others. This unique Workbook offers valuable and practical tips, along with thought-provoking questions and space for journaling, to encourage greater self-care and well being. This workbook is provided as an interactive tool to support you in making your journey as a caregiver easier. Written in a language caregivers can relate to. AgingPro�s philosophy begins with taking care of yourself first so that you can help take care of others. Filled with tips and thought/feeling provoking questions, this workbook assists you to explore your own caregiving process and feelings. It can be an invaluable way to get perspective, maintain balance, express feelings about difficult topics and gain peace - in your mind and heart. Keep these tips handy for times when you need a reminder to take care of yourself. 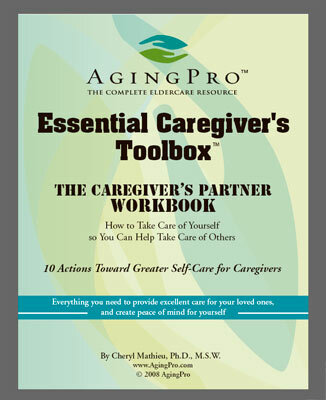 Give yourself, or another caregiver, the gift of this workbook. To your health! Caring for an older loved one? Your health and well being are very important! This ebook offers 10 action steps for your mind, emotions, body and spirit - so you can take to better care of yourself and create health and balance. After each tip there are thought-provoking questions and space to journal. Keep these tips handy for times when you need a reminder to take care of yourself so you can help take care of others. Please enter your email address below to join our newsletter so you can be kept informed of the latest developments and updates within our company. All content copyright © AgingProTM 2008 - 2009. All rights reserved.